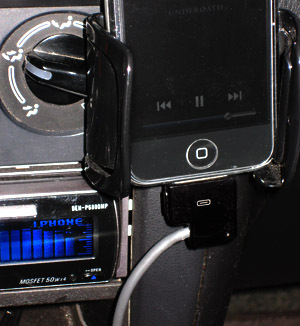 I’ve been using the Belkin Auto Kit for my iPod for a while now. The kit offers power while also pulling line-level audio from the unit’s dock connector. I rout this audio to rear auxiliary inputs on my Pioneer DEH-P6800MP. It’s a really great setup, as I get power and audio with one plug, and it’s a direct connection so I don’t have to mess with a FM transmitter (which is pretty worthless in the city I live in). Unfortunately, I can’t take a call with the Belkin unit plugged in. If I try to answer, sound only comes out of the phone’s speakers (not the car’s sound system) and the call is horribly distorted. This has me really wanting a product that doesn’t seem to exist. I’d like a car audio cable that charges, pulls line-out audio from the dock connector, and also routes call audio through the car’s sound system. The unit would have a mic built into the dock connector with noise-canceling circuitry used in current hands-free car kits. Or even better would be a mic on the end of a cord that could be routed up the A pillar to be closer to the driver. I know that there are plenty of Bluetooth systems out there, but it seems like such a cheap addition to existing wired-audio kits to add the same functionality without spending hundreds of dollars and dealing with pairing / interference issues. If anyone knows of such a product that already exists, please point me in the right direction. Otherwise, I’d love to see Belkin update their existing Auto Kit to provide hands-free functionality for the iPhone, or for another company to step up.